Researchers from the Rice University have reported that developing a batch of carbon nanotubes that are identical might not be as simple as scientists had hoped. 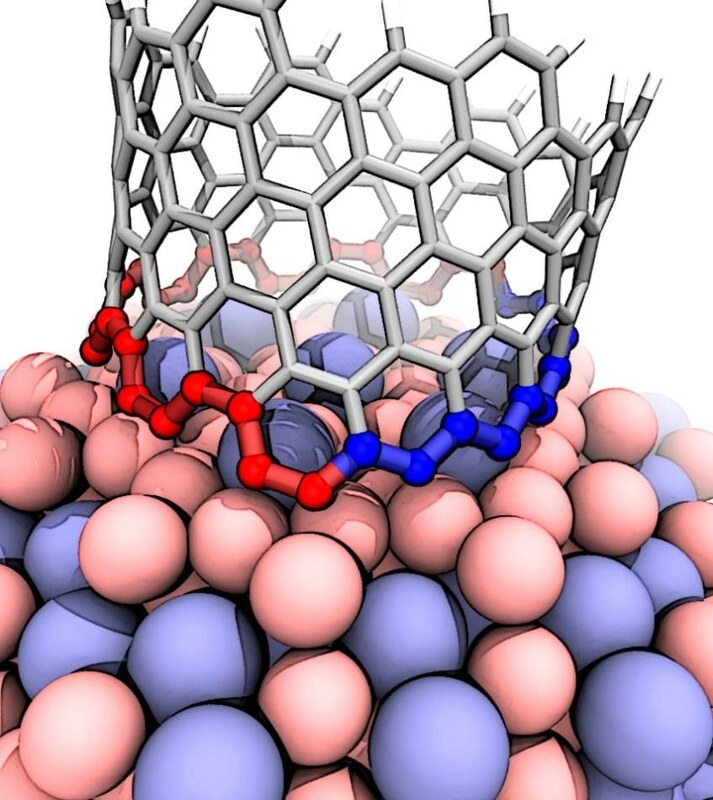 Rice materials theorist Boris Yakobson and his colleagues opposed a theory that when nanotubes are grown in a furnace, a catalyst with a particular atomic arrangement and symmetry would reliably make carbon nanotubes of similar chirality, the angle of its carbon-atom lattice. Rather, they discovered that the catalyst under consideration starts nanotubes with a range of chiral angles but redirects merely all of them toward a fast-growing variant called (12,6). The reason seems to be a Janus-like interface that is formed of armchair and zigzag segments—and eventually changes the way nanotubes grow. Since the electrical properties of a nanotube are determined by its chirality, the potential to grow chiral-specific batches is a long-sought goal in nanotechnology that seems impossible to achieve. It could result in wires that, in contrast to aluminum or copper, transmit energy without loss. In general, nanotubes grow in random chiralities. The Rice theoretical study reported in the Nano Letters journal published by the American Chemical Society could be a significant step toward synthesizing catalysts that produce homogenous batches of nanotubes, stated Yakobson. Yakobson and colleagues Evgeni Penev and Ksenia Bets and graduate student Nitant Gupta attempted to solve a puzzle presented by other experimentalists at a 2013 workshop who used an alloy of tungsten and cobalt to catalyze single-walled nanotubes. In that lab’s batch, over 90% of the nanotubes had a chirality of (12,6). The numbers (12,6) are coordinates that relate to the chiral vector of a nanotube. Carbon nanotubes are rolled-up sheets of two-dimensional graphene. Although graphene is highly conductive, upon being rolled into a tube, its conductivity relies on the angle, or chirality, of its hexagonal lattice. Armchair nanotubes - termed so due to the armchair-like shape of their edges—have identical chiral indices, such as (9,9), and are highly sought-after for their perfect conductivity. They are different from zigzag nanotubes, such as (16,0), which could be semiconductors. If a graphene sheet is turned merely by 30° will modify the nanotube formed by it from armchair to zigzag or vice versa. “We read and digested that, but we still couldn’t wrap our minds around it,” he stated. Soon after the 2013 conference, the Yakobson lab published its own theory of nanotube growth, which demonstrated that the balance between two opposing forces—the speed at which atoms attach themselves to the growing catalyst-nanotube at the interface and the energy of the catalyst-nanotube contact - are responsible for chirality. Five years after that, it has turned out to be very true in their new paper, although with a new dimension. The Rice calculations indicate that the Co7W6 alloy boosts the formation of the Janus-like interface that guarantees the necessary kink at the edge and enables carbon atoms to attach themselves to the foundation of the nanotube. However, the catalyst also drives the nanotube to include defects that modify its initial chirality midstream. We uncovered two things. One is that the carbon atom types at the base of the nanotube separate into armchair and zigzag segments. The second is the tendency for the formation of defects that drive the chirality, or helicity, change. That makes (12,6) a sort of transient attractor, at least during short experiments. If they were able to grow forever, (12,6) nanotubes would eventually switch to armchairs. The strange pattern of growth might have been detected quite earlier in the absence of an age-old typo that necessitated some steadfast detective work. As soon as the error was identified, Bets and co-author Gupta revisited the 1938 German paper that was the first to precisely outline the structure of Co7W6. Although they had that in hand, the calculations performed by the researchers involved using every bit of computing power that could be found to simulate the energetic connections between each atom in the catalyst and carbon feedstock. “We figured out that if we had run the calculations in series instead of in parallel, they would have taken the equivalent of at least 2,000 years of computer time,” stated Bets. The study was supported by the National Science Foundation. Computing resources were provided by the National Energy Research Scientific Computing Center, supported by the Department of Energy Office of Science; the Department of Defense Supercomputing Resource Center; the NSF-supported XSEDE supercomputer; and the NSF-supported DAVinCI cluster at Rice, administered by the Center for Research Computing and procured in partnership with Rice’s Ken Kennedy Institute for Information Technology.